Turkey and dumplings is a warm and hearty dish that is prime for using those Thanksgiving turkey leftovers. It's very similar to Cracker Barrel's chicken and dumplings, where the dumplings are rolled into a sheet and sliced into squares. As an added bonus, the extra flour on the dumplings thickens the broth and creates the perfect creamy texture. Reading this and it's not near Thanksgiving? Not a problem! 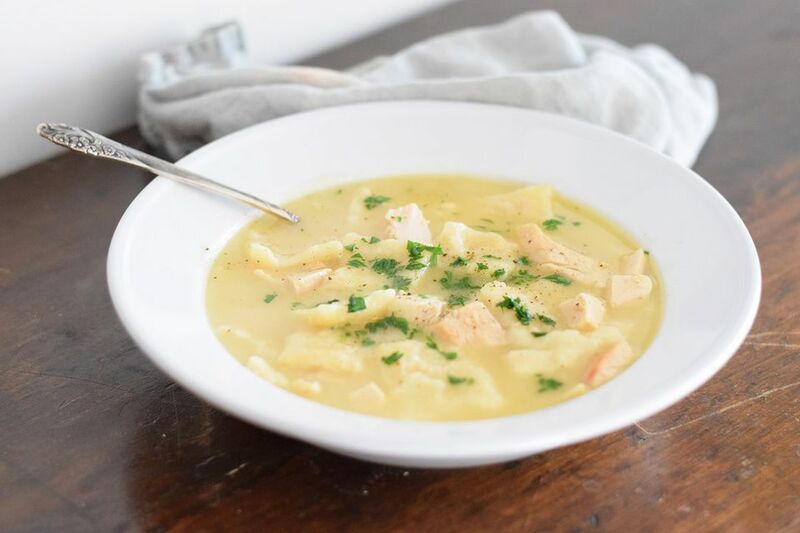 This recipe can use any turkey or chicken leftovers that you may have and makes a great meal for those colder nights. If you can make homemade stock from a leftover turkey or chicken, it will taste even better, as bone broth is full of nutrients and creates a delicious and hearty flavor. Enjoy this gem of a bowl, no matter the season. Add the butter to the flour mixture and combine using two forks or a pastry blender until the butter is the size of small peas. You can also use a food processor to combine the ingredients as well. Pour the buttermilk over the flour and butter mixture and stir with a spatula to combine until it becomes a soft dough. Be careful not to overwork the dough. The less it is mixed up, the more tender the dumplings will be. After you have created the dough for the dumplings, heat the broth in a large dutch oven or pot until boiling. While the broth is heating, dust a clean kitchen surface with a generous amount of flour and roll out the dough into a 1/4-inch thick sheet. Slice the dough into small squares using a pizza cutter to create the dumplings. Add the dumplings a few at a time into the boiling broth, making sure not to dust off too much of the extra flour as it will thicken the broth. Continue adding dumplings until there are no more left. Cook for 8 to 10 minutes or until the dumplings are tender and fluffy and the broth has thickened. Add the cooked turkey to the broth and heat until it is warmed through. Serve with the parsley if using and enjoy.